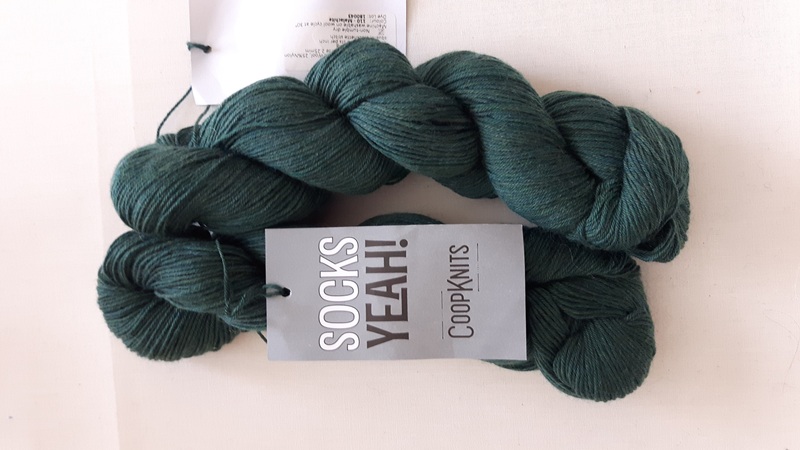 So Sorting through my stash recently reminded me that I bought some lovely sock yarn last year when I bought the oatmeal coloured wool, that I used for my recent socks. Obviously I cast on the cheaper of the wools after I got them and the nice stuff has been sitting in my wool box for a while now waiting for me to pick up the courage to knit it up. Well tbh it has mostly been waiting for the Autumn to come around again so that I could stop sailing so much and actually get some time to knit. But now that knitting time is upon us again I need to find a pattern for another pair of socks which will get some showing off… This is where my dilemma is. I have this gorgeous Socks Yeah! wool in the colourway Malachite, which is a lovely deep forest green, and I want a pattern that will really show it off. I’m just not sure what. I have compiled a bundle of my favourite sock patterns on Ravelry but I don’t know what ones to pick. I still love the Viking socks that I based my Oatmeal Socks on, but I think it might be overkill to have two pairs of the same pattern socks. Also I am not sure if the cables will show up as well in such a dark colour compared to how well they worked in the lighter oatmeal. I just have no idea which one I want to knit. I have tried to show the original pattern image and a version of it that someone has done in a dark greeny wool to see if the pattern would show up enough in the wool that I am planning on using. I have a feeling that the Fledermaus pattern is a little busy and unless this wool has really great stitch definition then the detail would be lost (looking at projects on Rav it seems to have quite good definition for other people). If I chose to knit the Grün ist die Hoffnung then I would want to adjust the pattern so that the lace chart was on the front of the leg, but I don’t think this would be TOO hard. Although I love the other two I am probably leaning towards either the Snicket or Lattice effect socks. Any thoughts or any more patterns to throw into the mix? I’m voting for the Snickets. 🙂 I like that pattern too. I think I will probably modify it so that it is much plainer over the foot, a bit like the lattice ones. I’m stuck on Lacery toe up socks so my opinion is useless. I agree, dark colours are harder to use to show up stitches and patterns. It may be the lighting but the Snicket socks would be my choice. Though it looks like it would mean a lot of purl stitches so the Lattice effect, which would also work, could probably be easier. I have only once made socks with a plain yarn and a those with a very easy pattern. Am beginning to think I should try something harder. You have a great number of choices above. Yes the choice of wool colour had such an effect on the outcome of a pattern. I couldn’t choose between that lot! I do love knitting socks, though, as they’re such a portable project. The portable ness is what attracted me to them in the first place. Very good travel knitting.